Glen Cove is in Nassau County. In today's edition of the Long Island newspaper Newsday there is an article about a bald eagle which had arrived in the area and was being fed by the locals. Wildlife authorities decided to relocate for fear it would become too dependent on humans. A quote from the story is the only Flag- related bit- "The sentiment in City Hall and the community was 'Do they have to take it away, why can't we keep it?' Glen Cove Mayor Mary Ann Holzkamp said, noting that an eagle graces the city flag." I haven't been able to locate anything further on the city's flag, but at least we now know that this NY municipality has one. 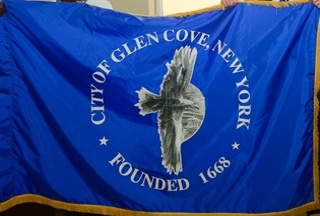 The flag of the city of Glen Cove is blue and has an eagle on it.